The Rolling Stones frontman Mick Jagger put style before comfort, wearing a gold brocade jacket as the band performed in Hyde Park on the hottest day of the year. 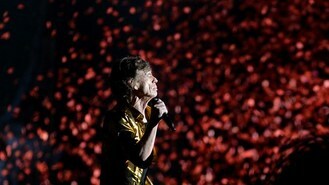 Rockers Jagger, Keith Richards, Ronnie Wood and Charlie Watts , who have a combined age of 276, rounded off the band's 50th anniversary celebrations at the Barclaycard Presents British Summertime Festival on Saturday night. They arrived on stage dressed to impress, with 69-year-old Richards draped in scarves and Wood, 66, wearing a stylish jacket covered in zips. After opening the set with their hit Start Me Up, Jagger, 69, flung off his jacket during second number It's Only Rock And Roll to reveal a sparkly shirt. He later shed the shirt to reveal a skin-tight black t-shirt, but continued to don costumes to suit the mood of the song throughout the evening, including a flashy gold number. He told the crowd: "It's fantastic to see you all here on the hottest day of the year so far. Are you surviving? Good." The sell-out concert saw 65,000 music lovers flock to London's Hyde Park in soaring temperatures for the rock legends' performance. The band performed hits including Brown Sugar, Jumping Jack Flash, You Can't Always Get What You Want and Satisfaction. Jagger joked they should keep the foliage-covered Great Oak stage in Hyde Park after the festival as a tree house for Boris Jonson to live in. As the rockers ended their set, Jagger told the fans: "This is the last show of this tour. Thank you for coming to see us all these years." But the band pointedly did not play The Last Time, leaving things open for another tour. Due to a serious chest infection, support act Tom Odell was not able to perform. A spokesman for Odell said: "He is gutted not to be supporting the Rolling Stones but he hopes that everyone has a fantastic day". He was replaced in the line-up by Hudson Taylor. Rihanna delighted fans at T in the Park as she headlined the second night of the festival with a pulsating performance. Tom Odell has pulled out of a warm-up gig for The Rolling Stones because of a serious chest infection. R&B queen Rihanna will headline the second day of T in the Park. The Rolling Stones have returned to London's Hyde Park - after a gap of 44 years and one day. Justin Timberlake brought SexyBack to London as he opened the Wireless festival. Britney Spears' sons get a little camera shy dancing with their mum to promote her latest song. Will.i.am has revealed he would love to work with Taylor Swift. Rihanna reportedly sparked anger from fans when she was three hours late to a show. Placido Domingo has said he expects his health to improve soon, after he was admitted to a Madrid hospital with a blockage in an artery of the lungs.